The latest comScore mobile subscriber estimates are out and according to this most recent study of U.S. smartphone subscriber numbers, for the first time in November 2010, Android passed the iPhone in total number of U.S. smartphone subscribers. According to the estimates there are about 61.5 million smartphone owners in the U.S. during the three months ending in November, up 10 percent from the preceding three-month period. 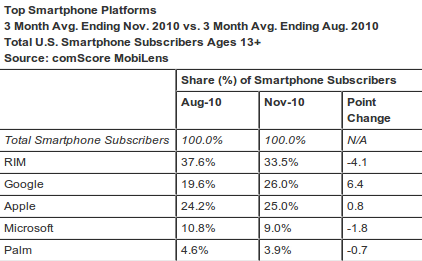 RIM still leads them all with around 33.5 percent market share of smartphones. But after several months of strong growth, Google Android captured no.2 spot from Apple iPhone and now holds nearly 26 percent of U.S. smartphone market share. Apple accounted for 25.0 percent of smartphone subscribers (up 0.8 percentage points) and is now a close third next to Google Android in terms of subscriber numbers which then is followed by Microsoft with 9.0 percent and Palm with 3.9 percent.